Similar to the 5-out motion, the 4-out 1-in motion is run using a set of rules that assist players in making their own decisions while reading the defense. This allows players to learn how to play the game of basketball (develop basketball IQ) instead of running an offense with predetermined actions that force players to play like robots. The most recent example of a coach successfully using the 4 out 1 in motion is Jay Wright at Villanova who led the Wildcats to the championship in the 2015 – 2016 season. Who Should Run the 4-Out 1-In Motion Offense? The 4-out 1-in motion offense can be run by any team. It’s a fantastic base offense with a lot of different options out of it depending on the skill levels of your players. I highly recommend this offense for teams with a strong post player as the spacing on the court makes it hard to trap the post. This spacing also provides your team with many opportunities to drive to the rim and will lead to many open shot opportunities as it’s hard to help and recover. Teaches Players How to Play Basketball – This is the most important trait I look for when choosing a youth basketball offense. A decision-making continuity like the 4-out 1-in motion offense develops basketball IQ and will assist players to be the best they can be in the future. Perfect Spacing – Many coaches claim that the 4-out 1-in motion offense has ‘perfect’ spacing. When in the wing and slot spots, the players will be about 18 feet apart. This is close enough that the offensive team can make sharp and direct passes, but far enough away that one defender can’t guard two players. Can Adjust to Any Skill Level – Due to the progressions of this offense, the 4-out 1-in can be as complex as you want or as simple as you want. It can be a great offense for a youth team simply running cuts, or a great offense for a professional team by utilizing all the different actions and reads. Can Adjust to Any Team’s Talent – With so many actions available, this offense can be adjusted to suit any team. If you’ve got a tall and athletic team, the offense can focus on curling off screens and back cuts. If you’ve got a quick team that shoots a high percentage, the offense can focus on flare screens and on-ball screens. Easily Exploits Mismatches – You can exploit mismatches anywhere on the court. It’s difficult for the defenders to help or trap because the offensive players are so far apart. Open Driving Lanes – Due to the great spacing of the offense, as long as your post player and perimeter players don’t get confused, there will be many opportunities to attack the rim off the dribble. Difficult to Scout – As this offense relies on players reading the defense and making decisions, it’s difficult for the opposition to predict what your team is going to do. Can Be Difficult to Learn – This has always been the biggest criticism coaches have about the 4-out 1-in motion offense. But by using the progressions in this blog post, I don’t think it’s difficult for any team to learn! Reading Others on the Court – While I believe it is easy to learn if taught correctly, it can be difficult for young players to execute during games because the offense relies on players reading the other 9 players on the court and making decisions. Can Be Difficult If Your Players Can’t Shoot – As with any offense, if you’re competing against an experienced coach and one of your players can’t shoot well, the opposition will often sag a defender in the lane which cuts off dribbling, cutting, and passing lanes as well as makes it difficult for players to post up. Fortunately, not many youth coaches will do this. 1. Keep Great Spacing – This is the most important rule of the offense. Perimeter players should always be about 18 feet away from each other. 2. Cut With a Purpose on Every Cut – Players must look like they’re going to receive the basketball on every cut towards the hoop. This involves showing target hands and calling for the basketball. 3. Never Pass and Stand – After a perimeter player makes a pass, they should never stay in the same place. What action they make will depend on what progression you’re up to and the actions you choose to use. 4. Watch the Cutters! – I’m not a fan of players holding the basketball for too long, but since this offense relies so much on cutters and off-ball screens, it’s important that the player with the basketball see the cutters and is ready to make the pass if it’s open. 5. Always Catch Looking to Shoot – Players must keep the defense honest throughout the entire possession. Always catch the basketball ready to shoot if the defense isn’t quick enough. 6. No Excess Dribbling – Don’t allow players to catch and put the basketball on the floor without thinking. Save the dribble. Only dribble when penetrating to the rim, using an on-ball screen, or improving a passing angle. 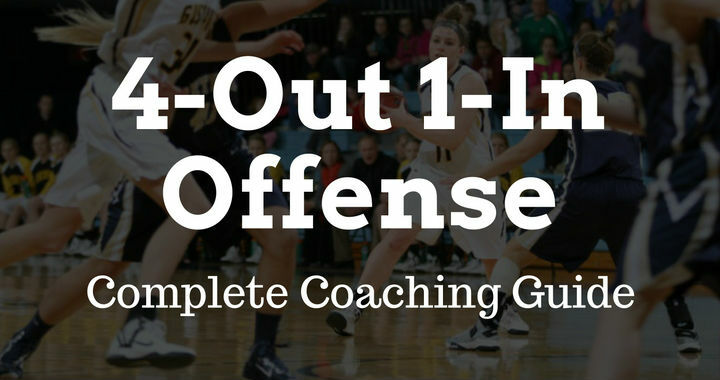 The 4-out 1-in motion offense is incredibly versatile so it’s important that you figure out how your team will best suit this offense before introducing it to your players. It’s impossible for teams to run every action, so you must figure out which actions work best for your team and focus on them. For example if your post player is the best player on your team, you’ll want them flashing to the ball-side more. If they’re not, keep them mostly on the weak side of the floor. Following on with this, the starting point for deciding how to run your offense begins with deciding how you’ll use the post player. The most common reason the 4-out 1-in motion offense isn’t always effective at a youth basketball and high school level is because the coach doesn’t know how to use the post player effectively. Many coaches simply allow their post player to move anywhere they feel like inside and around the paint. This will never work! The post player must have rules they’re required to follow. If you have decided to run the 4-out 1-in motion offense with your team, the very first thing you must decide is how you’re going to use the post player. 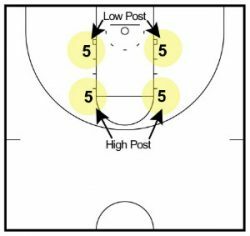 This is my favorite way to utilize the post player when running the 4-out 1-in and will be the option I refer to throughout this article. It involves the post player staying on the weak side of the floor but giving them the opportunity to flash to either the low or high post if they see an opportunity to do so a certain number of times per possession. • The lane to the rim will stay open for driving, cutting, and passing by the perimeter players. • Your post player will have great position to secure offensive rebounds. • There will be many drive and dish opportunities. When your post player does flash to the basketball and establishes position, they’re allowed to hold their position for a maximum of 2 – 3 seconds before they must quickly retreat to the weak side again. Be patient when first implementing this offense as it will take time for the post players on your team to learn which opportunities are best to take. I recommend you begin by allowing them to flash to the basketball one time per possession. When they’re a little more experienced at reading the defense and knowing when to flash to the basketball, you can increase this to two flashes per possession. 2. Post player must always stay on the weak side the entire possession. For this option, we remove the post players opportunities to flash to the basketball throughout the possession. I want to make it clear that using this option will not result in the post player being left out of the offense completely. There will still be plenty of drive and dish opportunities as well as offensive rebounding opportunities. a. You don’t have a post player on your team capable of creating their own shot or a shot for another player from the post. b. You want to keep the lane open to the ring for drives, passes, and cuts for the entire possession. 3. Post player must always stay on one side of the floor the entire possession. The theory behind this post option is to take advantage of a post player who is more effective on one side of the floor while keeping the other side open for drives to the rim. There can also be pre-determined actions that can only be run on specific sides of the floor. For example flare screens on the post player’s side of the floor and back cuts on the open side of the floor. I’ve seen this run successfully by a few teams but it makes the offense too restricted and predictable. I don’t recommend it. The only time this is the best method to use is when you’ve got a post player who is by far the best player on the court and you plan to feed the basketball into them on every single possession. Since players like this are incredibly rare, I’d advise against using this method. So, which post option should you choose? 1. Keep your post player on the weak side of the floor and allow them to flash to the basketball a certain amount of times per possession. 2. Keep the post player on the weak side of the floor at all times. Both options fit perfectly with the 4-out 1-in motion offense I’m about to show you. To decide which option is best, I recommend evaluating each player on your team who will play in the post and decide which option is best for each post player individually. Don’t be afraid to allow your starting post player to flash to the basketball while keeping your backup post player exclusively on the weak side when they’re in the game. Post players must earn the right to be allowed to flash to the basketball and create a shot for themselves or a teammate from the post. For those you don’t believe are ready, keep them on the weak side and encourage them to improve their post game. Also, ensure that all players on your team understand how to play the post position. You never know when you’re going to get a mismatch and want to take advantage of it inside. This is also a great strategy to use when one of the opposition players gets in foul trouble. Send the offensive player they’re guarding into the post! The other thing you should understand before we get into the heart of the offense is how players must fill around the perimeter. When filling spots around the perimeter players must read their defender and make one of two cuts. If the defender is within one step of the line to the basketball, the player must v-cut to get themselves open on the perimeter. If the defender is two steps or further away from the line of the basketball, the offensive player should blast cut towards the basketball. Rick Majerus calls these the ‘blast cut’ and the ‘fill cut’. For the perimeter players, there are 4 spots around the three-point arc that are primarily used in the 4-out 1-in motion offense. We call them the slots and the wings. These perimeter spots should be a step outside the three-point line to maintain ideal spacing. For the post player, there are 4 spots around the paint they can move to depending on whether on how you decide to use them within the offense. These are the two low blocks and the two elbows. When first teaching the 4-out 1-in motion offense to your team, I recommend putting flat cones on the perimeter spots so that players have a guide. I have broken the 4 out 1 in motion offense down into 7 progressions to teach a team the offense from scratch. The reason we teach in progressions is because it makes the offense far easier to understand and also because it allows players to start learning the basics of a complex offense from a young age. If you were to teach a young team a complete offense immediately, they’ll have no hope of understanding it. There’s simply too much information for them to process. Instead, use this method and only advanced to the next progression when your team can complete the current progression with minimal mistakes. Once your players understand the complete offense, there are also many additional actions that you can choose to implement based on the skill level of the players on your team. I’ll show you these in the ‘advanced actions’ section of the article. The first progression involves basic passing, basket cuts, and filling the spots around the perimeter. This is the simplest way to teach players the different positions on the court and get them used to the different cutting movements involved in the offense. Every time a player passes the basketball, they must cut. On each cut, all players must fill towards the basketball. The post player should stay on the weak side during this progression if you’re using them how I recommended at the beginning of the article. 1. 1 passes from the slot to 3 on the wing. 2. 1 will then basket cut making sure they step within the charge and then replace 2 on the weakside wing. 3. 2 and 4 will both fill towards the basketball using a blast cut or v-cut. 4. 5 stays on the weak side of the court. 1. 3 passes to 4 and then cuts towards the rim. 2. Since the only spot left to fill is their own, 3 cuts back out to the ball-side wing. 3. Everyone else holds their positions since there are no spaces to fill. 1. 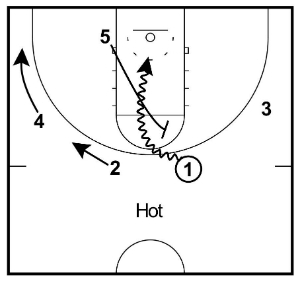 4 passes to 2 and then cuts through the paint to the rim and then out to the weak side wing. 2. Since there is a spot to fill closer to the basketball, 3 v-cuts and replaces 4. 3. 5 cuts across the lane to continue being on the weak side of the floor. • Allow your players to run this progression for as long as it takes them for the movements to become almost automatic. Sometimes this is a few weeks, sometimes it takes a few months, but don’t rush this progression. 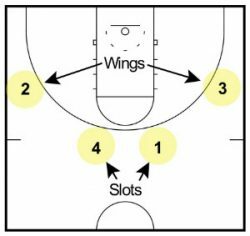 • This first progression alone can make for a great youth basketball offense. • Once your players have used the cuts a couple of times, allow the post player to flash to the basketball once per possession. • If the post player flashes towards the low block and there’s a slot to wing pass, the slot player must always cut behind the post player. • Players must cut all the way through the charge circle on each cut while looking at the basketball. If you don’t have a charge circle on your court, instruct the players to run under the rim. • On any basket cut, a perimeter player can post up for about 2 seconds if they feel like they have a mismatch on the inside and the post player hasn’t flashed towards the basketball. • Remember that when filling spots around the perimeter players should be using either blast cuts or v-cuts. The next progression will be much quicker than the first since it involves the same cutting and filling strategies as progression 1. For the 2nd progression, we’ll be teaching players to back cut when they’re being overplayed by their defender. Explain to your players that any time their defender has a hand in the passing lane whilst the player with the basketball is one-pass away and looking at you, you must back cut immediately. And never hesitate. No exceptions. Here’s how the back cuts work from each position. 1. 3 is being overplayed by their defender so they cut immediately without hesitation. 2. If 2 doesn’t receive the pass from 1, they pop back out to the same position. 3. All other players stay in their spots since there are no spots to fill. 1. If 4 is being overplayed by their defender, they immediately back cut looking to receive the pass from 3. 2. If they don’t receive the pass, 4 replaces weak side wing. 3. 1 and 2 then fill cut towards the basketball. 1. If 2 is being denied by their defender, they must back cut through the paint looking for the pass. 2. If they don’t receive the pass, they exit on the weak side wing replacing 1. 3. 1 fills towards the basketball replacing 2. • You can teach this by adding defenders and getting them to play ‘dummy defense’ switching between normal denying or overplaying the passing lane. • Constantly stress to your player that they must never hesitate. If the defender is denying the pass, back cut immediately! Once your players understand the basic cutting and filling movements, it’s time to add dribble penetration to the offense. One of the perimeter rules is: If you think you can beat your defender off the dribble and get to the ring, do it! With all the movement in the offense, the defenders will be constantly closing out late. This provides the offense with a great opportunity to attack the ring and create shots off dribble penetration. This is the main reason why it’s important to keep your post player on the weak side of the floor for the majority of the possession. If the offensive player is always between the ball and the basket, it’s going to be very hard for your perimeter players to penetrate and get a high percentage shot which is where most shots will come from in youth basketball. Each time there’s a drive, the post player must read their defender (who will help on the drive) and find an opening on the weak side anywhere from the baseline to the elbow. Create a passing lane. The only deviation from this is on a baseline drive from a wing player. When this happens, the post player must get to the front of the rim. This creates the best passing opportunity to the post player and also open up the hammer pass to the opposite baseline corner. Each player must read where their defender is and create a passing lane so they can receive the kick out pass for the open shot. If the player penetrating passes out and the shot isn’t open, all players must communicate and adjust to the original 4-out 1-in positions. 1. 3 receives the basketball and elects to drive towards the baseline. 2. 5 steps to the middle of the paint to create a better passing angle. 3. 1 slides down to the corner to open up the hammer pass. 4. 2 and 4 read their defender and get themselves open on the perimeter. 1. 3 receives the basketball and elects to drive towards the middle of the floor. 2. 5 rotates under the rim to open up the passing angle. 3. 1 and 2 cut down to get themselves open for the pass. 4. 4 stays at the top of the key to play safety. 1. 2 receives the basketball and elects to drive towards the baseline from the slot position. 2. 1 slides down to the corner to get open if their defender helps on the drive. 3. 5 slides up the key to open up the passing lane since their defender must help. 4. 3 and 4 attempt to get open on the weak side and also play safety. 1. 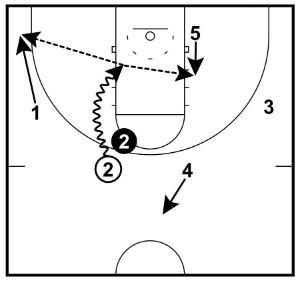 2 receives the basketball and elects to drive middle from the slot position. 2. 1 and 3 both slide down to the corner to open up the passing angle for the three-point shot. 3. 5 stays low and reads his defender who must help on the drive. 4. 4 steps back and plays safety. • All players must catch the basketball on the perimeter ready to attack the basket. • Players should be driving past their defender in as straight of a line as possible. This means attacking just outside of the defenders hips which keeps the dribbler in their lane and keeps great spacing. • Make sure your players are practicing making a ‘floater’. If they get into the lane they’ll be using that shot a lot during this offense. Giving players the option to screen away. For this progression, the player who receives the screen must always curl off the screen to the basket and the player who sets the screen must always pop back out to their original position after screening. This screen can occur on a slot to slot pass or a slot to wing pass. The only time this can’t happen is on a wing to slot pass as there’s no perimeter player the opposite direction to screen. 2. Instead of basket cutting, 1 decides to set an away screen for 4. 3. 1 sets an away screen on 4’s defenders back hip and 4 quickly cuts off the screen to the basket looking for the pass from 3. 4. 1 pops back out to the same position. 5. 2 fill cuts to the slot from the wing. 6. 4 fills out to the weakside wing. 1. 1 passes to 4 on a slot to slot pass. 2. Instead of cutting to the basket, 1 decides to set an away screen for 3. 3. 3 uses the away screen and cuts to the basket looking to receive the pass for the easy layup. 4. 1 then pops back to the basketball. 5. 3 then fills out to the weak side wing (the position they started in). • It’s important that the player who receives the pass holds the basketball for a second or two to see if either of the players involved in the screen get open. • For the player setting the screen, it’s important that the screen is set on the correct angle. This means the screeners back should be facing towards where the cutter wants to go (the rim). Since players are only curling off the screen, the screen should be set on the back hip of the defender. • If the defender anticipates the screen and cheats over, the player receiving the screen can back cut to the rim. The fifth progression involves giving players a third option to perform after they have passed the basketball to a teammate. When a player makes any pass during the offense, they can step up and set an on-ball screen for the player with the basketball. When they do this, the player screening must call out the player with the basketball’s name and also hold their arm up in a fist to indicate they’re about to set an on-ball screen. For the screen to be effective, the player with the basketball must be patient and wait until the screen is set before using the screen. The post player should immediately find a good passing angle when their defender rotates to help on the player with the basketball. 1. 4 passes to 1 and then sets an on-ball screen on 1’s defender. 2. 1 waits until 4 is set and then attacks the rim off the on-ball screen. 3. 2 and 3 both slide down to the corners to open up passing angles. 4. 5 stays low to be open for the dump-down pass. 5. The screener stays behind to play safety. 1. 4 passes to 2 and then sets an on-ball screen on 2’s defender. 2. 2 waits until the screen is set and then attacks them rim. 3. 1 and 3 slide down to open up passing angles for the three-point shot. 4. 5 swings under the hoop for the drop-down pass. 5. 4 plays safety after setting the screen. 3. 5 steps high to open up the hammer pass and also open up a passing lane. 4. 3 and 1 both slide down to be open for the three-point shot. • Players must select their actions based on the other offensive players on the court. Never set an on-ball screen for a player that can’t dribble the basketball. • Remember what was said about screening angles in progression 4. The screen should be set on the back hip of the on-ball defender so that they can’t slip under the screen. Next, we give another cutting option to a player receiving an away screen. While the players will now be experienced with curling off an away screen, we will also give them the option to straight cut depending on how the defense reacts to the screen. A straight cut will involve the player filling the spot that was occupied by the player setting the screen. If this option is used, the screener cuts to the rim looking for the pass and then fills to the perimeter as normal. Here’s what you must remember: On an away screen, one player must fill the spot closest to the basketball and the other player must cut to the rim. It’s up to the player receiving the away screen to decide which is used. The screener must watch the cutter and go opposite. 1. 4 passes to 2 on the wing. 2. 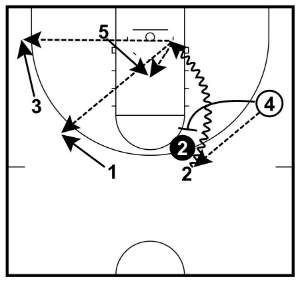 Instead of cutting to the basket, 4 sets an away screen for 1. 3. 1 reads their defender and decides to straight cut to the ball-side slot position ready to catch and shoot. 4. Seeing this, 4 rolls to the front of the rim looking for the catch and layup. 5. If 4 doesn’t receive the pass, they fill to weak side wing while 3 fills to the next slot position. 1. 4 passes to 1 on the slot to slot pass. 2. 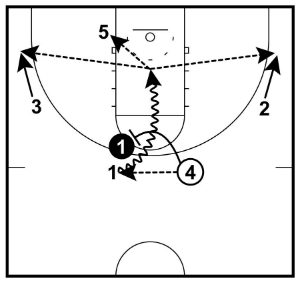 4 sets an away screen for 2 on the wing. 3. Instead of curling to the rim, 2 straight cuts to the slot position getting ready to catch and shoot. 4. Reading this, 4 cuts off the screen to the rim looking for the easy layup. 5. If 4 doesn’t receive the pass, they fill out to the weak side wing. • If you’re trying to delay the game while keeping possession of the basketball, get your players to perform straight cuts out to the perimeter on all away screens. • Make sure your players understand how they should decide which cut to use. If the defender is trailing them, curl to the rim. If the defender cheats under the screen, straight cut. The ‘dribble at’ action can be used when the opposition team is putting on a lot of denial pressure. This is an efficient way to get the basketball around the perimeter when you want to get the basketball into a specific position. For example, if you wanted to get the basketball into the low post from the wing but the wing is being denied. The task for the coach is to decide which option/s your team is going to use. For youth basketball, I recommend only using the back cut option every time one player dribbles at another. For high school and above, feel free to use both options. 1. 4 dribbles towards 2 on the wing. 2. Noticing this, 2 immediately back cuts. 3. If the pass is open, 4 will pass to 2. If not, 4 continues dribbling to the wing position. 4. Since 2 doesn’t receive the basketball, they fill out to the weak side wing. 5. 3 and 1 also fill towards the basketball. 2. Seeing that there is no back cut opportunity, 2 steps forward and receives the handoff from 4. 3. 2 now has the option to attack the rim or dribble to the slot position. • If running a hand0ff, the other offensive players must read this and stay in their spots. If a back cut is run, all players must fill towards the basketball. • Again, for youth basketball I recommend back cuts every time there’s a dribble at situation. Once your team is comfortable with the 7 progressions of the 4-out 1-in continuity motion your team will have a very solid base offense with many options and also an offense that will develop basketball IQ. Now that your players understand the offense, it’s important to keep improving it. This occurs as players start to learn the strengths and weaknesses of their teammates and make decisions accordingly. I think we can all agree that setting an on-ball screen for the power forward who isn’t a great dribbler is never a good idea! This will take some time to get to the point where your players look fluid on the court. Stick with the process and be patient. It will all come together. There are many additional actions that you can run out of the base 4-out 1-in motion offense that are optional inclusions. Teach your players the base offense (the 7 progressions) first, and then adding these as ‘plays’ out of the base offense. Call these actions out of time-outs, out-of-bounds, or when you need a basket in a crucial moment of the game. Which of these actions you choose to implement into your offense will depend on the skill sets of the players on your team. Find the plays that take advantage of your best players’ strengths. 1. 1 passes to 4 on the slot to slot pass. 2. 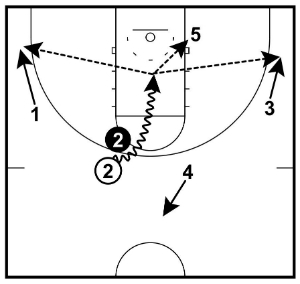 3 steps up and sets a flare screen on the blind-side of 1’s defender. 3. 1 takes 1-2 steps forward and then flare cuts off 3’s screen. 4. 4 takes 2 dribbles to improve the passing angle and then passes to 1 on the wing for the shot. 2. 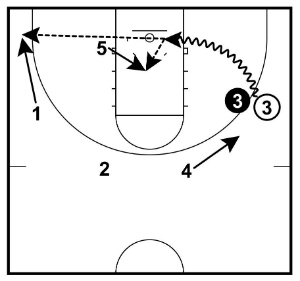 5 then sets a flex screen for 3 who cuts across the lane looking for the pass and open layup. 3. 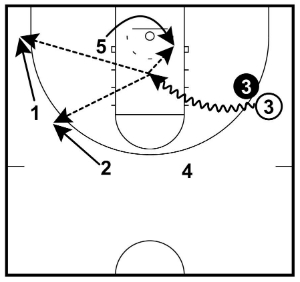 1 then sets a pin down screen in a screen-the-screener action for 5. 4. 5 curls or straight cuts off 1’s screen depending on their skill set to receive the basketball for the open shot. 2. 2 and 4 set a staggered screen for 2. 3. 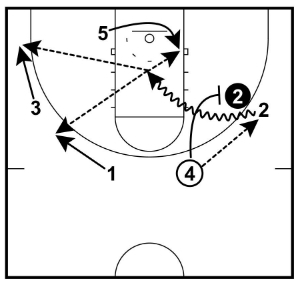 2 curls off the staggered screen to the ring looking for the basketball. 4. 1 then sets an immediate screen on 4’s defender. 5. 4 curls to the elbow looking for the catch and shoot. If it’s not open, they clear out to ball-side slot. 6. If 2 didn’t receive the pass for the layup they clear out to weak side wing. 7. After setting the second screen 1 clears out to weak side slot. 1. 1 passes the basketball to 3 on the wing. 2. 5 sprints up to set a UCLA screen for 1. 3. 1 cuts off the UCLA screen looking for the basketball for the open layup. If they don’t receive it, 1 clears to the corner. 4. 5 then immediately sets another screen for 3. 5. 3 waits until the screen is set and then attacks the rim. 6. 3 now has the option of finishing in the lane or kicking out to 3 shooters behind the three-point line. 1. On a pass from 3 to 1, that triggers 4 to go and set a down screen on 2’s defender. 2. 2 then takes a few steps in and then bursts out to the perimeter looking for the catch and shoot. 3. 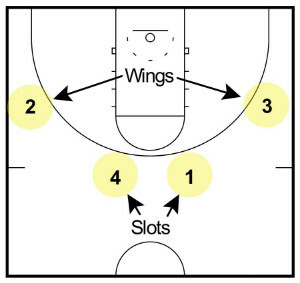 4 must hold this screen for as long as they can legally and then pop out to fill the wing. 4. This will often lead to a late close out by 2’s defender which means easy dribble penetration. 1. On the pass from 3 to 1, 4 sets a blind-side screen on 2’s defender. 2. 2 takes 1-2 steps forwards and then bursts out on the flare screen to the wing. 3. 1 takes 1-2 dribbles across to improve the passing angle and then makes the direct pass to 2 for the shot. 4. If 2 catches but the shot or drive isn’t open, 4 has popped out and you’re still in motion. On any pass into the low post, the ball-side wing player must cut to the weak side. This forces the other defenders to focus on their player and make adjustments to their position instead of allowing them to double team or read the post player. We want the low post player to receive the basketball with their low foot above the low block so that there’s space for the baseline cut and possible bounce pass for the layup. If the low post player is on or below the low block, it leaves little opportunity for this cut to be effective. When this happens, the alternative cut is to make a Laker cut. A Laker cut is a cut to the strong-side elbow and then through to the baseline corner. Even though I haven’t discussed much about the post catching in the high post, the same rules exist. The wing player must cut baseline so that the help defenders must move and rotate out of position. Establishing offensive rebounding position and transition defense is crucial if you’re going to run the 4-out 1-in motion offense well. For this offense, we will rely on 2 or 3 players to fight for offensive rebounds depending on where the shot is taken from the outside. If the shot is taken from inside the three-point line, encourage players inside the key to fight for offensive boards and those outside the three-point line to transition back on defense. The post player always fights to the front of the rim on a shot from anywhere on the floor. If the outside shot is taken from the wing, the weak-side wing player must sprint in to rebound on the weak-side while the post player fights for position in front of the rim. This leaves us with 3 players who must immediately transition back onto defense. If the outside shot is taken from the top of the key, both weak-side wing players sprint in to rebound on their respective sides while the post player fights for position at the front of the rim. This leaves the two slot players to transition back on defense. To keep players from going through the motions, it’s important that you have a specific action your team runs when the shot clock is winding down. The best way to end a possession is with a ball-screen from your post player. Since the 4-out 1-in motion offense provides great spacing at all times, there’s always a great opportunity for a ball-screen. The simplest thing you can do is get the basketball to your best playmaker or scorer, and then sprint your post player out to set an on-ball screen for them. This can occur in either of the wing positions or slot positions. I recommend you have a key word (I use ‘hot’) that you or the players can call out with 5 – 7 seconds left on the shot clock to trigger this action. This advanced option can be a very effective if you have experienced players who can run this quickly and efficiently. The first step is to get the basketball to one of the wing players. Instead of the post player sprinting out to set an immediate screen on the player with the basketball, they first set a UCLA screen for the ball-side slot player who cuts through looking for the basketball and quickly pops out to the weak side. Immediately after setting this screen the post player takes a few short steps to the wing and sets and on-ball screen for the player with the basketball. 1. If forces all defenders to rotate an extra position and stay with their player. If we only set a straight ball-screen the weak-side defenders will already be in help position. 2. Provides the offense with an extra opportunity via the slot player cutting to the rim off the UCLA cut. Use a different keyword to trigger this option (I use ‘cold’) and once again call this out with about 5 – 7 seconds left in the shot clock. For both of these options the post player must sprint to the screen to create separation between them and the post defender for best chances of success out of the ball-screen. With a few adjustments the 4-out 1-in motion offense can easily be run against a 2-3 zone defense. For it to be most effective and easy for the players to understand, we want to do our best to stay within the structure of our current offense with minimal changes. Here’s a few ways to do it. As the basketball is swung around the perimeter the post player should establish a deep post seal on the inside zone player. This is a great opportunity to get the basketball inside from the wing. Within any 2-3 zone there is an area between the bottom line of defenders and the free-throw line that is usually left open for a majority of the possession. To take advantage of this, any time a player basket cuts they must ‘hook and look’ when passing through that area of the paint. The player cutting can hold this position for 1-2 seconds before continuing their cut to fill the perimeter. It’s imperative that the perimeter players are watching these cuts and are ready to feed the basketball inside if it’s open. Often the middle player of the zone will have to step up leaving an easy drop-down pass to our post player for the layup. When playing against a zone you can often find a big advantage by changing the role of your post player and keeping them on the ball-side of the zone. Especially if you’ve got a post player that can make the midrange shot. Since we play the wing spots high on free-throw line extended, the bottom post player is often forced to rotate out and help to stop open shooters. This leaves the short corner completely open for your post player to receive the basketball. If the middle player of the zone steps out to help the middle of the zone will be open for cutters to receive the pass for an open layup. Another great option against a zone is to create a classic overload situation. We accomplish this by running the slot player to the ball-side corner on a pass to the wing. This forces 2 defenders to guard 3 players and puts the offensive team at a big advantage. This action will often lead to an open three-point shot from the corner. And the 7,000 word 4-out 1-in motion guide has come to an end! This is one of the most popular offenses at all levels of basketball for a very good reason. It can be adjusted to suit any age and skill level, it can be run positionless (rotate the post player), and since it’s a decision-making offense it will develop your players’ basketball IQ. Along with the 5-out motion and read and react offense, the 4-out 1-in motion offense is one of my main recommendations for all youth basketball teams. If you’re coaching a youth basketball team, use it!